All I want for Christmas is WATER! Guess what Santa brought us for Christmas? A broken water heater and valve!!! This might not have been the work of Santa but of that sinister Grinch or Scrooge. I would have preferred coal because at least we could have done something with it. Apparently Santa also doesn’t read this blog because if he did, he would know all the good will and cheer I attempted to spread onto others through apron making. He would never have done something like this if he had read my blog and seen what a wonderful person I have been lately. Hmphf. Thanks goodness I have been on two mission trips. In Peru, I learned the fine art of dumping water into a toilet to force it to flush. In El Salvador, I learned the fine art of pouring clean drinking water into a cup and submerging my toothbrush and toothpaste into it to maintain proper dental hygiene. On some very microscopic level, and I emphasize microscopic, it has helped me salvage a bit, and I emphasize a bit, of sanity which isn’t saying much. 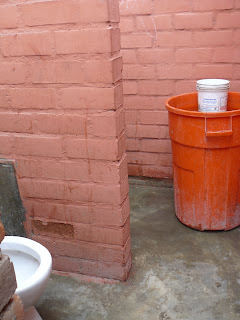 Here is a picture of a toilet in Peru outside of an elementary school. The orange bucket is full of water, the white bucket is using for pouring. 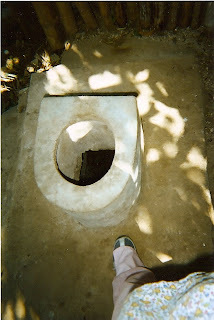 And this is a picture of a toilet in a poor village in El Salvador. This is actually a very nice toilet compared to what a wonderful pastor and his family used to have. If I look on the bright side, at least the broken water heater and valve waited until our Christmas Eve company left before deciding to act the fool. And if I continue to look at this as a glass half-full moment, than I must continue to be joyous that Isaac was feeling sick after our Christmas Eve company departed. That’s because instead of going to a late night Christmas eve church service, Ike, Aaron and I stayed home. Isaac was trying to go to sleep but heard this annoying tick-tick-tick sound in his room. I thought I found the culprit to the sound and turned off a few ceiling fans. However, the tick-tick-ticking continued. Being the mama of a Soldier, I thought it sounded like a bomb. Freaked me out a little. The sound was relentless and I pressed my ear to the walls trying to figure out from whence the maddening noise was coming. Aaron saw me listening to the wall completely dumbfounded as to the source of the problem. Pressing my ear to various places on the wall, I told him this reminded me of a close family member who had suffered from mental illness who also heard things in the wall. It was one of those awkwardly funny comments and Aaron wasn’t sure what to say. Thankfully I wasn’t the only one hearing this sound. When the Hubs and Nate returned from church, Aaron was fast asleep, Ike had relegated himself to another room to sleep and the Hubs and OS began to hunt for the sound. That’s when we discovered that the tick-tick-tick was actually a drip-drip-drip coming from the attic and Christmas Day arrived with a very unwelcome gift…no running water. You can get batteries on Christmas Day but you can’t get a new water heater and valve at a gas station! Where’s a Jewish plumber when you need one?